The Maretron PT-SNUB-01 Pressure Snubber is used in combination with the Maretron FPM100 Fluid Pressure Monitor and a pressure transducer FPM100 accessory. The PT-SNUB-01 dampens pressure variations between a pressure source and the pressure transducer, both smoothing the changes due to pressure spikes and surges and protecting the pressure transducer from these changes. 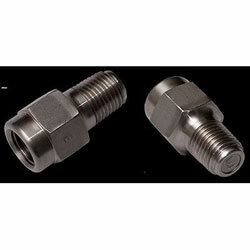 The PT-SNUB-01pressure snubber is equipped with a NPT male threaded fitting for installation into the system being monitored. Install the pressure snubber to a NPT female fitting on the system or tank to be monitored with a maximum torque of 150 in-lbs (16.95 Nm).